Tomorrow's soldiers won't just know when they're being shot at, they'll be able to locate and track snipers on personal PDAs, thanks to a new helmet-mounted acoustic gunfire detection system. The new system, developed by scientists at Vanderbilt University in Nashville with funding from the Pentagon's mad science agency DARPA, uses four microphones mounted on each soldier's helmet and networked using the radio frequency Zigbee system. Like other shooter location systems, the system relies on the sound waves produced when a high-powered rifle is fired. These acoustic signals have distinctive characteristics (a muzzle blast 'bang' followed by a supersonic bullet 'whizz') that allow the system to pick them out from other loud noises and track them back to their source. Current systems rely on centralized or stand-alone sensor arrays. By contrast, the new network combines information from a number of mobile microphones (or nodes) to triangulate on shooter positions. "Because the microphones on the helmet are so close together, the precision is not very high," says Akos Ledeczi, the senior research scientist on the project. "However, the nodes are continuously exchanging the times and angles of arrival for these acoustic signals, along with their own locations and orientations. When two or more nodes detect the shot, they can provide a bearing with better than one degree accuracy and a range typically within a few metres." The system communicates its findings via Bluetooth with soldier's PDAs. These are loaded with maps or overhead pictures of the area upon which the shooter locations are displayed. 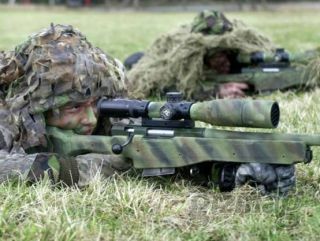 Field tests have demonstrated that the system can pick out the location of sniper rifles even when they are firing at the same time as submachine guns like the AK-47. One problem using a mobile network has been keeping track of the positions of each soldier with sufficient precision. Standard GPS is inadequate and satellite coverage can be spotty in urban environments. The Vanderbilt team solved this problem by adding an inexpensive radio chip that allows them to track the nodes using high-precision radio interferometry. These smart nodes form self-organizing wireless-sensor networks and are the realisation of the Pentagon's 'smart-dust' concept of radically reducing the size and cost of sensor networks for military applications. Current commercial shooter location systems are extremely expensive, with prices ranging from $10,000 (£7,000) to $50,000 (£35,000) per unit. By contrast, an entire node for the new system weighs only slightly more than the four AA batteries that power it and costs about $1,000 (£700) to construct using currently available commercial hardware.